English Bites by Manish Gupta is an ideal book for anyone who is intrigued by the English language. It will definitely satiate your curiosity and will help you to improve your English vocabulary. Through this book the author regales about his tumultuous journey of conquering the English language. When look and see have similar meanings, how can overlook and oversee be opposites? If you decide to be bad forever, you decide to be bad for good! How can the weather be hot as hell one day and cold as hell the next day? They are head over heels in love. That’s nice, but don’t we do almost everything head over heels? Were you scratching your head over these? Well, I thought you would to do so. Now tell me the longest English word you know. Yes, you can scratch your head as much as you like! Okay. I will give you a hint. It has to be at least 35 letters long. Yes, you heard me right, at least 35 letters and no, you cannot go to Google. Well, if you are wondering why I am flaunting my English skills today, then let me tell you about the source of my newly acquired skills. 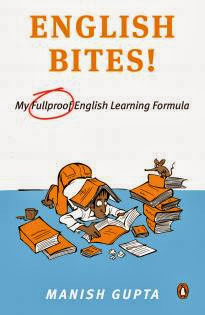 It is English Bites by Manish Gupta. I received a review copy from the author for an unbiased review of the same. English language was the author's biggest nightmare at a point in life but, eventually with perseverance and incessant toiling he finally overcame it. English Bites is a unique English learning guide that is designed to make learning new English words easy and interesting. The use of jokes, anecdotes and amusing trivia about words, makes it a one-of-its-kind English learning book. Whether you are an individual looking to increase your word bank, or are preparing for CAT/GRE/GMAT, this book will certainly help you. The format of the book is interesting. The author highlights interesting new words in bold and shares its meaning in the footnote. This saves you the time of looking up the word in the dictionary. Although, I did feel at times that it was interrupting the flow of the book. However, one can choose completely overlook this section and refer it only when needed. This is not a book that you can sit down with and read in a go. Instead, it is one that needs to be read slowly, a chapter or less at a time. When I started reading this book, I made it a point to bookmark the parts I liked by folding the page. As I progressed with the book, I realized there was no point in doing so, as in every other page, there was something new. This book is not a piece of fiction and is not meant to tell you a story. It has only one aim - to help you with the English language. However, in this process, the author shares incidents and stories from his life that lightens the learning experience for the readers and breaks the monotony. However, at some points you might feel that there is too much happening, or it is too much to absorb. It is a sign that you must keep it aside for a while, ruminate over what you have learnt and come back when ready for more. Lastly, it is a book that you will have to read more than once to be fully able to learn from it. I will leave you with an interesting excerpt from the book that left me laughing out loud. I would like to thank the author for offering me this book for review. I recommend this book to all English language enthusiast and lovers. About the Author: Manish Gupta is a banking professional. When not crunching numbers, he examines the vagaries and idiosyncrasies of the English language. An engineering graduate from Punjab Engineering College and an MBA from XLRI School of Business and Human Resources, he lives in Mumbai with his life and two daughters. P.S: If you would like to know which is the longest English word or other English language trivia, get yourself a copy of English Bites. I am so happy to know that you liked the book. Thank you very much for a wonderful review. I am also extremely happy that I could, in a small way, further fuel your love for this language. I enjoyed reading it, learning new words, expanding my dictionary and yes I will keep coming back to it for more for this book is like an ocean where the learning does not end with the book.